In 2004 the global inventory of the arthropod species of the United Arab Emirates was initiated, a venture launched and sponsored by His Highness Sheikh Tahnoon Bin Zayed Al Nahyan of Abu Dhabi. 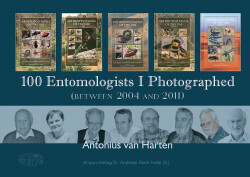 The author of the present book – Mr. Antonius van Harten – was the scientific coordinator of the project and is the editor of a book series ‘Arthropod fauna of the UAE’. Insects and other terrestrial arthropods were collected countrywide and made available for study to specialists in 32 countries. The coordinator visited museums and research institutions in 14 countries to assure their collaboration. Specialists from 14 countries came to collect in the United Arab Emirates. The photographs of the entomologists included here, were made during those years and travels. Four volumes of the book series were published until 2011, but the work still was far from complete. Fortunately, in 2014 a fifth volume of ‘Arthropod fauna of the UAE’ was published, this time sponsored by the Department of The President’s Affairs in Abu Dhabi. A sixth volume followed in 2017.